The picture above has shocked and affected me deeply. It shows a man about to be thrown to his death from a high building in Iraq. According to the original news source, a large crowd was gathered below to watch him fall and then die as he hit the ground many metres below. Another man was then killed in the same way. This happened within the last couple of days; the photo, along with some others, was released by IS on Friday. The men’s ‘crime’ was that they were deemed to be gay. The method of execution is that prescribed by the Koran. Religion – in this case Shari’a Islam – lies behind and motivates behaviour of such profound inhumanity. It could be argued too that this is part of the culture in which these people live and as such, must be respected. Really? So what is ‘cultured’ about murdering people? I’ve been asked recently whether I shouldn’t respect the right of people to hold religious views. But how can I – or anyone in a civilised society – accept the right of others to believe that, simply because someone’s perceived sexuality ‘offends’ an imaginary god, that person should die? And not only that, but that they merit a sentence of such barbarity? I can’t respect such views, nor anyone’s ‘right’ to hold them; they will, inevitably, act upon them, just as we see here. There are Christians too who support the death penalty for homosexuals (for example, here, here, here, here and here). 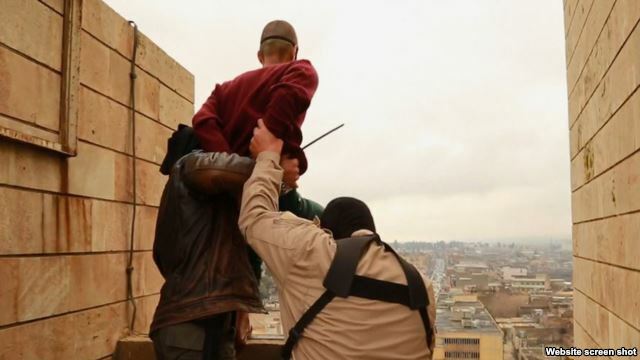 Well, you men of God, this is what it looks like, though I guess your preferred method of execution would be to stone them to death, just as your own ‘holy’ book advocates (Leviticus 18.22, 20.13). No respect is due to people who behave like this towards others, nor to the religions that ‘inspire’ them. Bullies who believe fellow human-beings should be executed because of who they are, and thugs who justify murder because it’s done in the name of an invented deity, are not worthy of anyone’s respect. Where is the international outcry about this? The solidarity? The politicians linking arms? The advocacy of the civilised world? Thank you, Nick, for your question and to Joe.My.God. This entry was posted in Christian failure, Christians and homosexuality, Extremism, In God's name, Terrorism and tagged Bible, Christian love, Christianity, God, homosexuality by Neil. Bookmark the permalink.